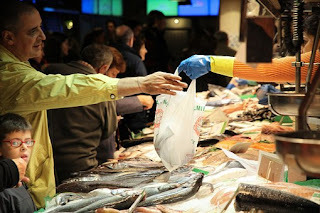 The fish market is a market used to market fish and fish products. In addition to fish, aquatic organisms and other marine caterers are also sold, such as squid and shrimp. The fish market can be aimed to sell fish wholesale to other fish traders or to retailers to consumers. The fish market also sells a variety of snacks made from seafood, and restaurants and food stalls that specializes in serving fish also stand near the fish market. The size of the fish market varies from small outlets to large markets such as the Tsukiji fish market in Tokyo that sells 660 thousand tons of seafood per year.